While most fly fishermen consider the Catskills the birthplace of American fly-fishing, the folks around Henryville, Pennsylvania might have a different view of history. Located in the Pocono Mountains of Eastern Pennsylvania, Henryville and the surrounding area just might have a justifiable claim as birthplace of American Fly-fishing. The area has always been known for the abundant trout producing streams. When Captain Daniel Brodhead purchased his 1500 acres in 1737 the cold flowing waters had been known by the Indian name of Analomik but it was not long before people started referring to it as Brodheads Creek. The beginning of the angling tradition begins almost a century later with a log cabin or Halfway House built by Arthur Henry along the freight road between Easton and Scranton Pa. At first, Halfway House was used primarily by the muleskinners and freighters with the occasional trout angler. In 1836 the log cabin was expanded and became known as Henryville House. The Brodhead was already developing a following of visiting anglers with the help of glowing fish stories written by the visiting newspaper columnist. A special section was devoted in the 1848 edition of "The Complete Angler" of fly patterns specifically for the Brodhead and surrounding streams. With the expansion of the railroads came the real invasion of fly fishers into the area. Around 1851, Thaddeus Norris noted fishing author was one of the early Brodhead apostles whose signature is found in old registers at Henryville House. That same year Norris experimented with a "dry fly method" as he describes it in detail in his "American Angler's Book" of 1865. 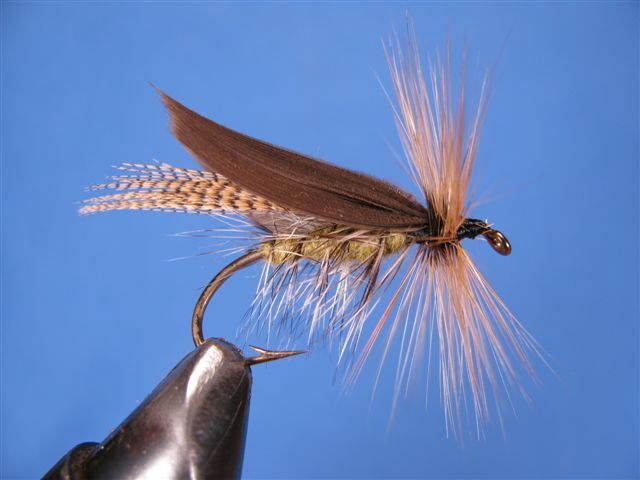 His efforts were made with hardly more than a heavily hackle wet fly that would land softly, float and be taken by a trout before it would sink. This primitive dry fly method was practiced on the Brodhead almost 25 years before the innovations of Theodore Gordon on the Beaverkill. Joining Norris at Henryville House was Samuel Phillippe the noted gunsmith and violin maker from Easton Pa., who, working with Norris developed the modern bamboo rod construction method. Mixed in among the fly fishermen the names of noted celebrities from the world of sports, entertainment and politics could be found on the pages of the register such as John L Sullivan and Lily Lang-try. Presidential candidates Grover Cleveland and Benjamin Harrison were registered at Henryville House simultaneously for a week of fishing just before their campaign in 1880. By 1890 the little river started its decline. Years of abuse from farming and logging had ravaged the landscape leaving the water shed vulnerable to the summer heat making the water too warm for the native Brook trout. The opening week end of 1897 was an historic event in the history of Henryville House for it marked the last time a group of wealthy fly fishermen known as the Brooklyn Fly Fishers held their annual ritual at Henryville House. They would move to the North to the Hardenburgh Farm on the Beaverkill where these early Brodhead fishermen would play a major role in the development and reputation of the Beaverkill and Catskills. Their departure marked an end to an era; the Brodhead and Henryville House would never be the same. Gone are the freight wagons and steam driven trains and native Brook trout, today anglers drive into the Poconos from Philadelphia and New York for a chance to land one of the stocked Brown or rainbow trout that have since replaced the Brook trout. I supposed very few of these fishermen know the importance these waters played in shaping the direction of our sport. I'm not really sure if it is safe to give all the credit or title of birth place of fly fishing to just one place, either the Catskills or Henryville . It is clear that the Catskills benefited from the progressive thinking and fly fishing innovations resulting from the work by the early Brodhead fishermen. But, the Catskills has produced innovations and contributed to the sport also and has maintained the high quality of fishing longer. Perhaps the Brodhead dropped the ball and lost the title when it allowed it's outstanding fishing resource to be reduced to that of only ordinary. I hope that perhaps the most important lessons the Catskills or any other fishery could learn for Henryville is to keep in mind just how important it is to protect this valuable and treasured asset. The fly known as the Henryville Special was first tied by Hiram Brobst, an old-time Pocono fly tier from LeHighton Pa. The fly was developed to be use for a caddis imitation on the fast boiling pocket water of the Pocono Mountains. The influence of the popular sedge fly from Europe can be seen in the laid back wings tied tent style. Countless other variations of the fly has been developed and used around the world.